Brighten up winter doldrums with some colourful, sparkling citrus! We're celebrating citrus week here on FBC with great citrus recipes all week from FBC members across the Canada. Whether you're looking for lemon recipes, lime recipes, orange recipes or something more exotic like grapefruit or clementines, we'll have something for you. 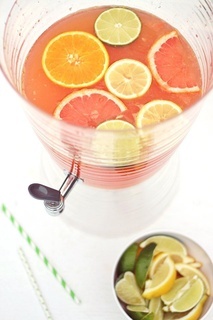 Today, we have five delightful citrus beverage recipe ideas to refresh and soothe! White Citrus Sangria from Justine at [Justine Celina](http://justinecelina.com/white-citrus-sangria/). Citrus Bliss Infused Water from Stacie at [Simply Stacie](http://www.simplystacie.net/2015/06/citrus-bliss-infused-water/). Lavender Lemonade Cold Brew from Lu Ann at [The Teacup of Life](http://theteacupoflife.com/2015/09/lavender-lemonade-cold-brew-recipe.html). I have to say, citrus bliss infused water is definitely my favorite on this list. I made one serving yesterday and brought it at work with me. But it’s certainly much easier to bring this beverage when using either an infused water bottle or a stainless steel water bottle.